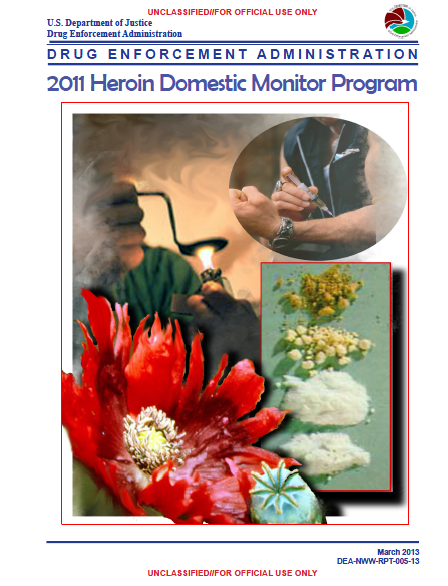 The following is the most recent report from the DEA’s Heroin Domestic Monitor Program and covers the period 2007-2011. A previous report produced by the program and available online covers the period 2003-2006. HDMP data for 2011 confirm that South America continues to be the primary source of heroin found east of the Mississippi River, while Mexican black tar and brown powder heroin clearly dominate the drug market west of the Mississippi. In 2011, Southwest Asian heroin continued to account for only a small portion of HDMP exhibits with its availability limited primarily to east coast markets such as Baltimore, Maryland; Newark, New Jersey; New York, New York; Richmond, Virginia; and Washington, D.C. In 2011, and for the sixth consecutive year, no Southeast Asian heroin samples were purchased through the HDMP. The Heroin Domestic Monitor Program (HDMP) provides data analysis on the price, purity, and geographic source of heroin sold at the retail (street) level in 27 US cities. In 2011, a total of 642 qualified samples were purchased. Of those samples, 323 were classified as South American (SA) heroin, 296 were classified as Mexican (MEX) heroin, and 23 were classified as Southwest Asian (SWA) heroin. In 2011, for the sixth consecutive year, no Southeast Asian (SEA) heroin samples were purchased through the HDMP. South America remained the primary source of heroin found east of the Mississippi River. According to 2011 HDMP data, SA heroin samples exhibited the highest average purity within the program at 31.1 percent, an increase of 5.2 percentage pointsi from 2010. HDMP data further indicated that the average price per milligram pure for SA heroin dropped in 2011 to $1.18, a noteworthy decrease from the 2010 price of $1.75 per milligram pure. Heroin produced in Mexico continued to dominate drug markets west of the Mississippi River. HDMP data indicated that the average purity of MEX heroin increased slightly in 2011 to 16.8 percent, up 2.1 percentage points from 2010. In 2011, the average price per milligram pure of MEX heroin decreased to $1.35 from its 2010 price of $2.00 per milligram pure. SWA heroin continued to account for only a small portion of HDMP exhibits (23 of 642 exhibits). In 2011, SWA heroin had the lowest recorded average purity within the HDMP at 12.3 percent, while maintaining the highest average price per milligram pure at $1.66. In 2010, SWA heroin averaged 20.9 percent pure with an average price of $1.21 per milligram pure. SWA heroin exhibits were purchased in Atlanta, Georgia; Baltimore, Maryland; New York, New York; Newark, New Jersey; Richmond, Virginia; St. Louis, Missouri; and Washington, DC. Exhibits classified as “Unknown” (UNK) were purchased in all but four of the HDMP cities. Heroin exhibits are classified as UNK when their signature profiles are inconsistent with the signature profiles of authenticii heroin samples collected from the four geographic source regions: Mexico, South America, Southeast Asia, and Southwest Asia. HDMP data from 2005 compared against 2011 data reflected a 42 percent increase in heroin exhibits whose signature was classified as UNK by the DEA Special Testing and Research Laboratory (SFL1). In 2005, 139 HDMP exhibits were classified as UNK, while in 2011 that number increased to 197. (See Appendix A. Note: Appendices B and C reflects data from 2010 and 2009, respectively.) In 2011, Atlanta, Chicago, Detroit, New York, San Juan, St. Louis, and Washington, DC, all experienced notable increases in heroin exhibits whose source of origin was UNK.